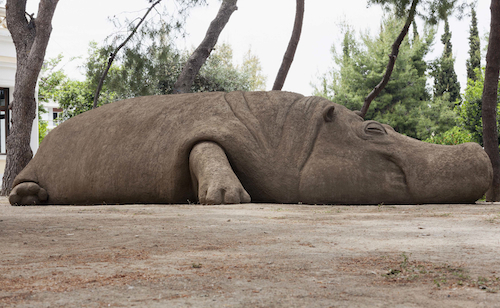 Allora & Calzadilla, Hope Hippo, 2015, polystyrene, resin, mud, plaster, sand, performer, newspapers, whistle, 16 x 6 x 5'. This is the first time the French School at Athens has opened its garden to the public—a result of the second collaboration between the Athens-based nonprofit NEON and the Whitechapel Gallery in London. The setting makes this exhibition, intended for a general audience, a success due to the garden’s kinship with many of the works on view. Never has Yayoi Kusama made so much sense, thanks to the placement of a bronze pumpkin sculpture with a black pattern—Pumpkin (M), 2014—on a patch of verdant grass. Likewise, Angus Fairhurst’s The Birth of Consistency, 2004, a bronze gorilla staring into a mirror pool in homage to Narcissus, seems to have found its rightful place in the world in a nearby clearing. Then there is Anthea Hamilton and Nicholas Byrne’s large-scale inflatable sculpture of ’90s pop icon Betty Boo, 2012, coyly positioned amid a group of slender trees. There is a whimsical sense of discovery created by the garden site. Works by Dionisis Kavallieratos, Athanasios Argianas, and Markus Karstieß are not at first readily visible, for instance, and there is a playful sincerity to the hunt to find them. Allora & Calzadilla’s Hope Hippo, 2015, makes a particular impact: The work consists of a rotation of attendants who each sit atop a giant hippo sculpted from earth, reading daily newspapers and blowing a whistle every time an injustice is perceived. This whistleblowing punctuates the idyll of the garden space with good intentions, just as the works in this exhibition have been inserted into a grounded, contemplative space so as to illuminate meaning without the noise of the marketplace.